St. Michael was one of the three archangels besides Saint Raphael and Saint Gabriel, to be venerated in the presence of God. He is celebrated as the warrior saint who is called upon to protect soldiers and ensure that victory lies in the hands of the good. Our beautiful and inspiring Saint Michael statue is a sculpture that comes very detailed and beautifully finished. 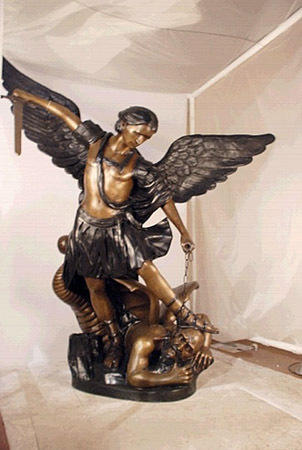 Here, Saint Michael is depicted with a sword in one hand as he battles Satan to the ground. Made of bronze. Hand finished. Ships in 2-3 weeks when stocked. When No Stock: Lead time 8-12 weeks. Contact csr@mygardengifts.comfor availability and most economic shipping quote.